Special Executive for Counter-Intelligence, Terrorism, Revenge and Extortion (SPECTRE) is a well-financed apolitical terrorist organisation with a low profile. It is equally apt at manipulating governments as gangs and has absorbed many lesser criminal organisations to rise to a state of shadowy supervillainy. No political allegiance or ideological position drives the organisation. Born at the height of the Cold War, many of its enterprises have concerned the provocation of major geopolitical powers to the benefit of some mysterious business organisation, and almost always for profit for SPECTRE's membership. On other occasions the organisation collaborated with rogue states or developing states with grudges against the Global North. After SPECTRE first came to the attention of MI6 - and 007 successfully assassinated and shut down the operations of Chinese nuclear-terrorist Dr. No - the committee of high-ranking SPECTRE agents turned their resources to discrediting and blackmailing the United Kingdom in general, and MI6 and its 00-unit in particular. SPECTRE missions have been known to require elaborate planning, major industrial resources and blackmarket acquisitions of anything from helicopters to rocket fuel. The organisation tends to prefer elaborate headquarters in out-of-the-way locales. On other occasions SPECTRE has infiltrated the workings of existing, multi-million dollar business empires and put their resources to work for evil means. Criminals working for SPECTRE do not often know the extent or reach of the organisation backing their illegal enterprises. Petty smuggling rings are utilised to acquire resources or to shield SPECTRE's more critical operatives from scrutiny. SPECTRE uses a mixture of trained assassins, intellectual geniuses to oversee their projects. SPECTRE are adept at turning high-ranking military and government agents and entice rogue generals, politicians and mid-level intelligence operatives to betray their nations for great financial gain. Missions: From Russia With Love, Thunderball, You Only Live Twice, On Her Majesty's Secret Service, Diamonds Are Forever, For Your Eyes Only, Never Say Never Again, SPECTRE. Fate: Killed by Domino on the Disco Volante, Bahamas. Fate: Killed by Tatiana in Venice. 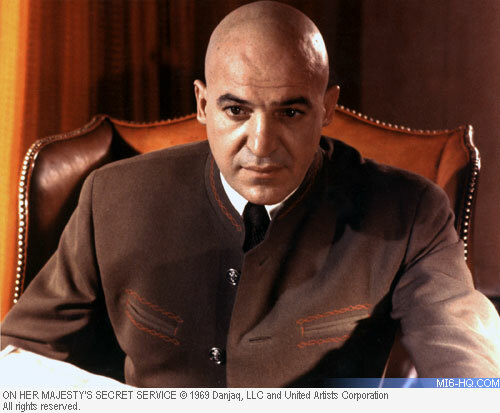 Fate: Killed by Morenzy in Blofeld's office, SPECTRE island. Fate: Killed by Bond in Anet, France. Fate: Eaten by Piranhas in Bofeld's volcano lair. Fate: Drowned in his own reactor complex, Crab Key Jamaica. James Bond investigates the mad scientist, Dr. No, who's double crossed east and west and is working for SPECTRE. Again SPECTRE is playing Cold War enemies off against each other in attempts to steal cypher codes and discredit British intelligence. SPECTRE procures two nuclear weapons and threatens to detonate the bombs at unknown locations unless their demands are met. The most ambitious SPECTRE plot finds Number One heading up the hijacking of Soviet and US space programmes for a profit. This time the mission is personal for Blofeld as he asserts his rights to the title Comte de Bleuchamp and threatens biological warfare. SPECTRE takes control of the Whyte empire and uses the billionaire's resources to smuggle diamonds and construct a space-based weapon. 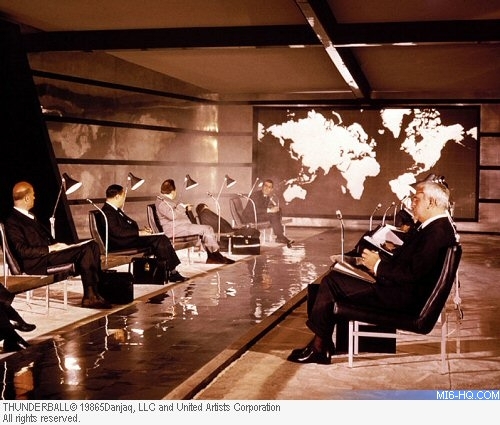 Blofeld seeks to gain real-time access to multiple intelligence agency databases to stay one step ahead.